Charles Frederick Malbon was born in Sutton on the Forest, a few miles north of York, in September 1878. He was the son of Charles Malbon and Elizabeth Mary Byrne who were married in West Derby, Lancashire in 1875. He had one brother George Denis who was a year older than him. We first find Charles Frederick in the 1881 census, living with his family in Balderton near to Newark in Nottinghamshire. His father was butler to Frederick Platt, Justice of the Peace and a former High Sheriff of Nottinghamshire. The Platts were living at Turnpike Hall (formerly and subsequently Balderton Hall). They had many servants. Charles and his family lived at Coachman’s House at the Hall as follows – Charles Malbon aged 29, Butler (domestic service), born Cheadle Staffs, Elizabeth his wife, aged 25, born in Liverpool, George Denis aged 3 and Charles Frederick aged 2 both born in Sutton, Yorks. Denis T. Byrne, a visitor aged 23, a Mariner, was also in the household that night. Denis was Elizabeth’s brother. Before 1883 Frederick Platt had moved to Barnby Manor in nearby Barnby in the Willows. 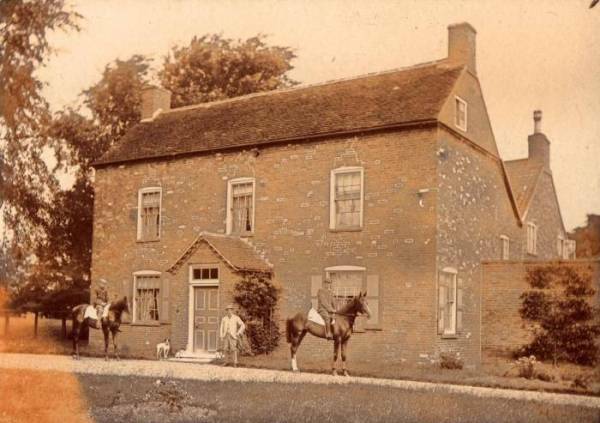 Charles Frederick and family cannot be found in 1891, but in 1901 they were living in Barnby in the Willows. Charles was still a butler, so it is probable that the Malbon family moved to Barnby when the Platt family (and servants) moved to Barnby Manor. On the 1901 census Charles was 48 years old and Elizabeth 45. Charles Frederick was 22 and an Estate Clerk. It is likely that he was also working for Frederick Platt on the Barnby Estate. Sometime between 1901 and 1911 Charles Frederick took up the position of Estate Agent for Lord (Llewelyn Nevill Vaughan Lloyd) Mostyn on the Mostyn Estate at Whitford near Holywell. In 1911 he was 32 years old and boarding with John Thomas Bithell and his wife at Mount Terrace, Rhewl, Mostyn. Charles was very active in the local community during his years in Mostyn, being mentioned in the newspapers on numerous occasions. For many years he played for the Mostyn Park Cricket Club. He was Captain, as well as being the Hon. Secretary on the Committee. Lord Mostyn was President. It was noted in one report that the Club were greatly indebted to Lord Mostyn for the use of the cricket ground and for his kindness in keeping it rolled and mown. A report in the Flintshire Observer on 27th August 1914 was about appointing a committee for the purpose of arranging matters in connection with the County Fund for the relief of those affected by the war. Charles Frederick was appointed to the committee. Another report on 12th August 1915, tells us that a Volunteer Corps was formed at Mostyn. Charles was appointed as a member of the committee. There were other articles in subsequent months describing the actions of the Volunteer Corps. Charles was named in many articles, including attending marriages, funerals, whist drives, etc. He was also a member of the Whitford-Mostyn Garden Society, the annual show being cancelled for a number of years during the war. Charles’s military records have survived, from which we learn that he enlisted in Holywell on 15th November 1915. He was 37 years old, was 5′ 10″ tall and had a 33-36″ chest. He was posted to the Army Reserve as a Private on 16th November 1915, his Regimental No. being 43745. On 6th June 1916, he joined the 12th Bn Royal Welsh Fusiliers, and in November 1916 he sailed from Southampton, onward to Rouen, and joined 5 IBD (Infantry Base Depot). The IBD was a holding camp. Situated within easy distance of one of the Channel ports, it received men on arrival from England and kept them in training while they awaited posting to a unit at the front. In January of 1917 he was posted and proceeded to join 16th Bn Royal Welsh Fusiliers. On 2nd April 1917 he was reported as being sick in hospital, and on 10th April he was sent back to England with boils, sailing from Boulogne on the Princess Elizabeth. On the 15th June 1917 he returned to France and again joined 5 IBD. It would appear that he was posted to 9th Bn RWF. In August 1917 he transferred and was posted to the Royal Engineers, 4th Field Survey Company. His Regimental No. was changed to 357805, and his rank to Sapper. Charles was reported wounded and missing, and officially considered as having died on or since 30th March 1918. He has no known grave but is named on the Pozieres Memorial, which commemorates those who died on the Somme between 21st March and 7th August, 1918.